Located on Glencrutchery Road, this is the Start/Finish of the races. It is also where the paddocks are located, andthere are plenty of refreshments available. 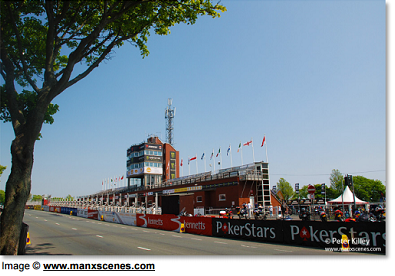 The Hoggery, headquarters of Manx Roadracing Medical Services, and The Rob Vine Fund is in the area behind the Grandstand, as well as the TTMA Office and the Manx Grand Prix office. Parking is available, accessed via St.Ninians Road off Ballaquayle Rd. 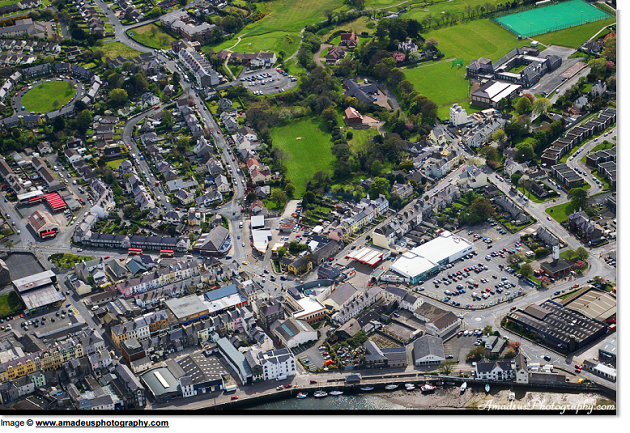 Having left the Grandstand, with Nobles Park and St.Andrew’s Church on the left, St. Ninians is at the top of Bray Hill. It is accessible when the roads are closed via Ballaquayle Road, which runs down to the left in this picture. There is a footbridge over the course (seen here). Toilets and refreshments are available in St. Andrew’s Church Hall to the left. There is no parking available, but it is within walking distance of the Grandstand. 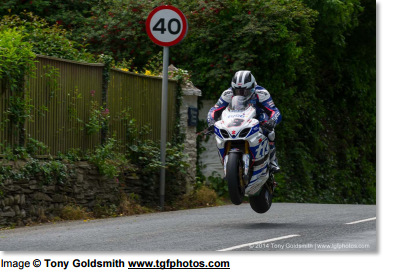 Going down Bray Hill (at racing speeds of 180mph+!) there are three roads on the left, Lancaster Road, Hildesley Rd and Malvern Rd. 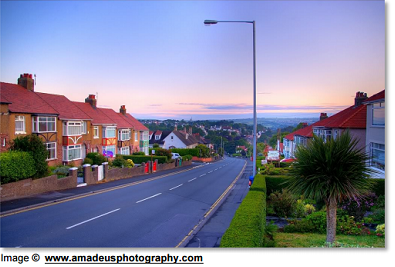 At the bottom of Bray Hill are Stoney Road and Thorny Road on the left and Tromode Road on the right. There are portaloos available on Thorny Road. 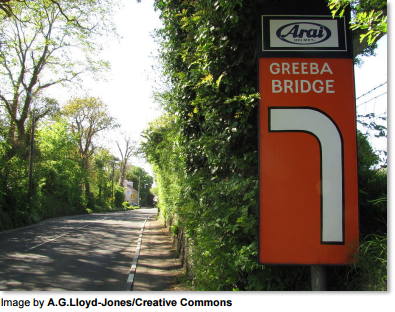 Just after Bray Hill is Ago’s Leap named after Giacomo Agostini, followed by Selbourne Drive on the left, and mile marker 1. Going down Quarterbridge Road, past Alexander Drive (which is a slight left hand corner sometimes referred to as Eyreton Corner), you come to Quaterbridge. The Quarterbridge Pub is on the outside of the course here. There is parking available but very limited. Generally there are quite a few spectators here. McDonalds is about half a mile away, on Peel Road. The National Sports Centre is also close by. 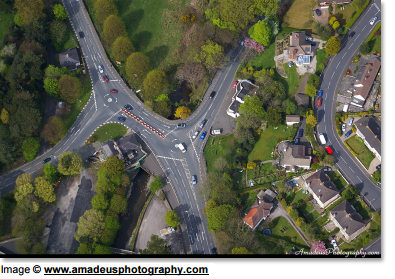 Quarterbridge is accessible when the roads are closed via Peel Road (which is the road heading towards the centre of Douglas, at the bottom of the picture above). When the roads are closed, but crossing points are open, a ‘corridor’ is open from Quarterbridge to Braddan to allow access to the inside of the course. The TT Access Road also starts from Quarterbridge, with the entrance off the Castletown Road, which is the road to the left in the picture above. The Access Rd can be very busy when roads are closed! A left hand corner by the Jubilee Oak tree followed by a right hand corner at Braddan Church. 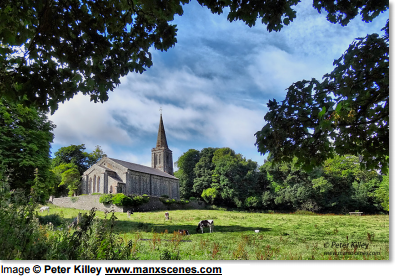 The church is accessible when roads are closed via Saddle Road (off the Castletown Road). 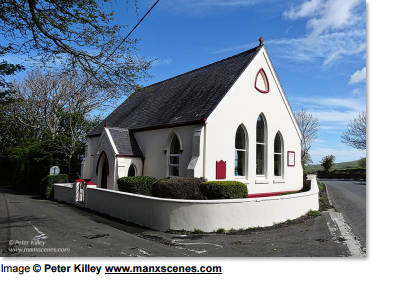 There is a small Grandstand at the church and refreshments are available at the Church Hall. The ambulance that is located at the oak tree for races and practices also covers the helipad at Nobles Hospital, which is about one mile away located on the inside of the course. 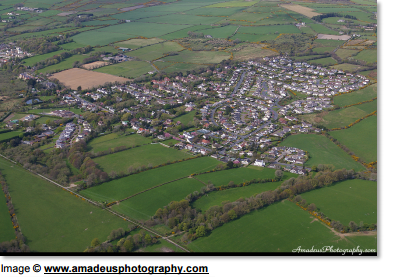 Leaving Braddan, along Peel Road, you pass a number of locations on the way to Union Mills: Parkinson’s Yard, Transmann, Rural Industries and Snugborough Trading Estate all on the right, and Ashlar Drive on the left, before entering Union Mills. 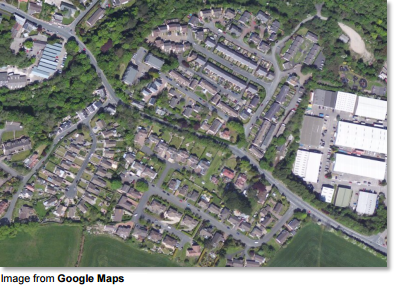 In the picture to the left you can see Ashlar Drive at the bottom right and Strang Road at the top left. Going through Union Mills, you go past the Railway Inn on the left, the garage on the left, the Church on the right and Trollaby Lane also on the right, onto the Ballahutchin. Strang Road, in Union Mills, is on the right hand side by the Spar shop. The entrance to it can be seen in this picture. Travelling up Strang Road you get to Strang, and Nobles Hospital. From there you can get to various other locations around Douglas. During racing and practices there is an ambulance located at Strang Road, from where it is able to access Nobles Hospital and the helipad. Leaving Union Mills the course goes up the Ballahutchin Hill to the top, known as Ballafreer, with Ballahutchin House on the left. 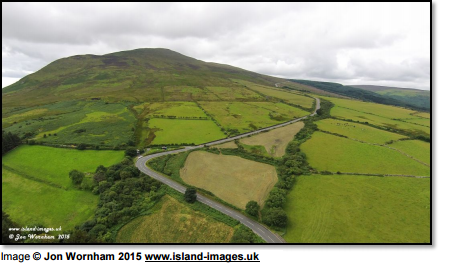 Past Elm Bank on the right and Glen Lough Campsite on the left and into Glen Vine and the fast right hander Ballagarey. Ballagarey Road is on the right at the traffic lights. Past the 4th Mile Marker, and Glen Darragh Road on the left at the second set of traffic lights. Marrown Church is on the left, as is Twisted Chimneys, which is a private house with unusual chimney pots. After leaving Glen Vine, a slight left hand leads into Crosby (the site of Dave Jeffries crash in 2003). 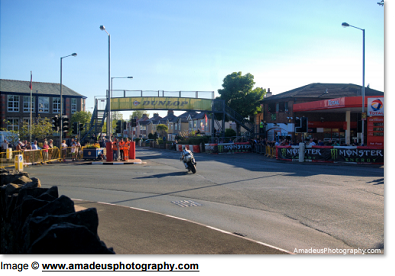 Crosby Church Hall is on the right, followed by Crosby Crossroads and then another iconic TT location, The Crosby Hotel, again on the right. There is parking here, as well as refreshments. It is a popular spot. On a big bike, the speed through here is up to 190mph. The 5th Mile Marker is a little way beyond the Crosby Hotel on the way out of the village. Crosby is accessible whilst the roads are closed. If you are on the inside of the course, you can get to The Crosby Hotel via the A23, Mount Rule road from Strang crossroads, and then onto Eyremont Rd. If you are on the outside of the course, you can get to Crosby via the B35 Garth Road off the A24 Cooil to Eairy road. After leaving Crosby you pass The Wagon and Horses on the left, The Highlander on the right (shown in the picture here), and Pear Tree Cottage on the right on the way to Greeba Castle. Greeba Castle is a right hand corner just before the 6th Mile Marker. It is also known as Hall Caine’s Corner, named after the Edwardian author who lived in the mock castle. Greeba Castle can only be accessed via open roads. Parking is usually available for the Marshals and Medical staff in the driveway of the castle. Check with the Marshals on site. Just beyond the 6th Mile Marker there is a series of left and right hand curves called Appledene. Beyond Appledene, on the right hand side is Cronk Dhoo Farm. This is a campsite. 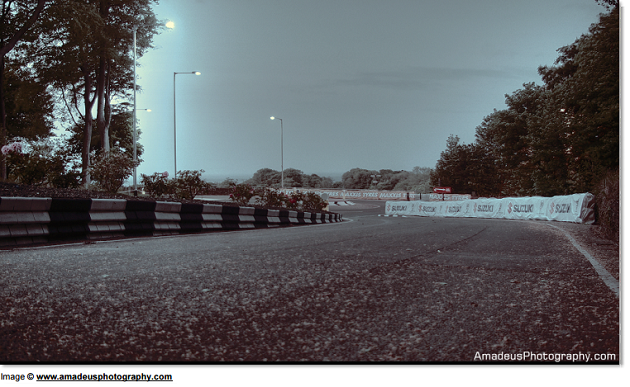 Like Greeba Castle, this section of the course is only accessible on open roads. After passing Cronk Dhoo Farm, at around 6.7 miles, is Greeba Bridge. It is a left hand corner. Just after it on the left is a church, built in 1881 named The Old Chapel. Like Greeba Castle, it is only accessible on open roads. 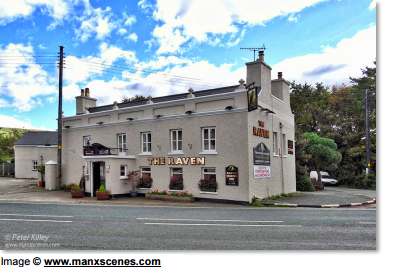 There is parking and refreshments available at The Hawthorn pub on the left as you leave Greeba. Warning, the midges can be bad all around this part of the course so you are advised to take insect repellant with you! 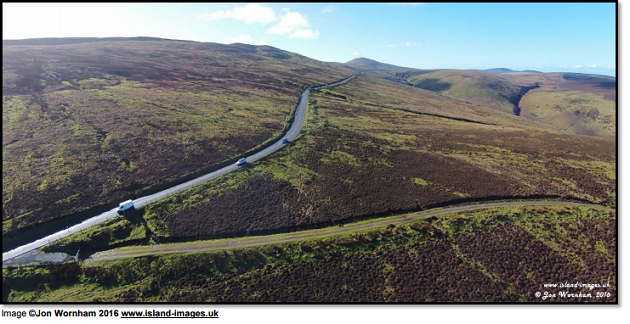 Having passed The Hawthorn, you pass Cronk Breck Farm on the right and Cronk Breck House on the left on the way to the fast right hander, Gorse Lea. Sometimes referred to as Harold’s or Harold Leece’s (after the landowner). This area is accessible whilst roads are closed via the back roads off the A3 Curragh Road from St.Johns to Foxdale and then on the Kerrowgarrow Road. Leaving Laurel Bank you pass the 9th Mile Marker, Glen Mooar Mills on the right, and Glen Mooar Garage (now closed). You then arrive at Black Dub also known as Glen Mooar. The word dub refers to the pond or bog that is situated to the left of the course, towards the exit of the corner. Black Dub is not accessible once the roads are closed. There is ample parking and refreshments are available there. Watch out for the midges which can be bad here and at Sarah’s! After Black Dub you pass through Vaaish Mooar, a right hand corner. The Vaaish is the plantation on the steep bank to the left overlooking Glen Helen. This section starts with a left hand corner, Glen Helen 1, and a left then right, Glen Helen 2. 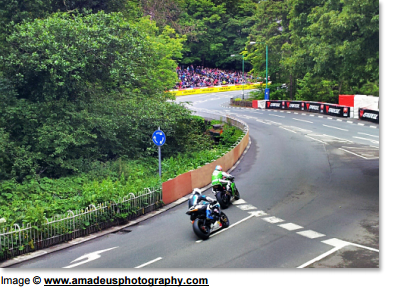 On the right hand side is The Glen Helen Hotel where there is plenty of parking, and also a radio commentary point. This section is only accessible when the road is open. There is a left hand corner after the hotel followed by Sarah’s Cottage, a right hander seen here in the picture. This leads on to Creg Willy’s Hill with the 10th Mile Marker at the top. 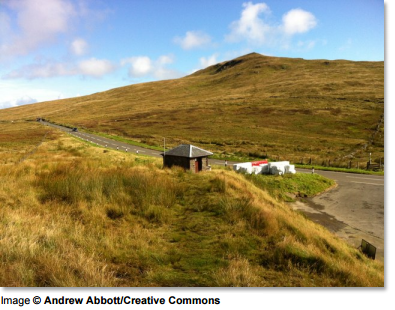 Just after the 10th Mile Marker there are some S-bends at Lambfell Mooar which lead onto the Cronk-y-Voddy Straight. 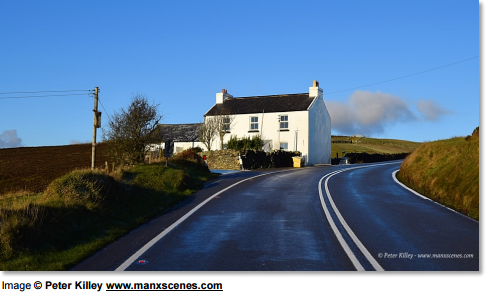 At the end of the straight is Cronk-y-Voddy Crossroads accessible via the back roads from Little London or from the A4 Peel to Kirkmichael coast road. There is parking and refreshments in the field on the left just past the crossroads. This is followed by a fast right hand bend, Molyneux’s, named after Dave Molyneux, the sidecar rider. It is also sometimes called Cronk-y-Voddy Flag. The 11th Mile Marker is on the left, after the crest. Just after the 11th Mile Marker is Burnside, a building on the right, followed by a long hedge on the left called The Stockade. This is a popular spectating point. 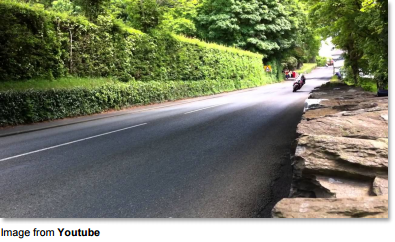 On the left hand side you will pass by the original 11th Milestone, seen in the picture here, and a series of left and right hand bends leading to Drinkwater’s Bend, a sweeping left hand bend named after Ben Drinkwater who died here in 1949 in the Junior TT. These areas are only accessible when the road is open. 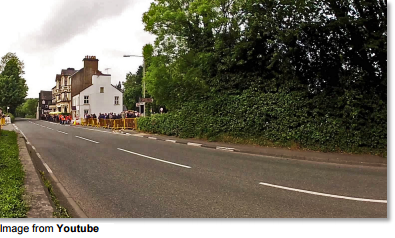 After Drinkwater’s Bend, you come to a left hand bend followed by a hard right hand bend known as Handley’s, named after Walter Leslie Handley, a 4 times TT winner in the 1920’s and 30’s. He crashed here in 1932. Handley’s cottage, on the right, is known as Ballameanagh. This area is only accessible when the road is open. After Handley’s, you come to the 12th Mile Marker on the right hand side. 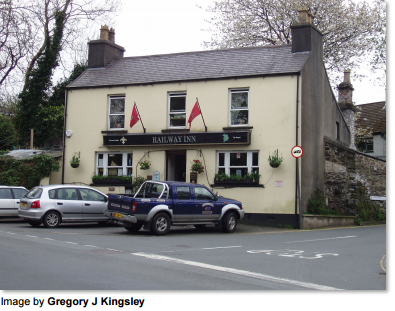 From Handley’s and the 12th Mile Marker, the course goes past Shoughlaigh Farm and McGuiness’s (formerly Shoughlaigh Bridge but renamed after John McGuiness), past Ballaskyr Farm on the left, on to the Top of Barregarrow also called Barregarrow Crossroads. Barregarrow Chapel, seen here, is on the left at the crossroads. Access is available via the B10 if you are inside the course, or by turning right off the A4 just after Glen Moar if outside. Parking here is limited but there are refreshments and toilets available. 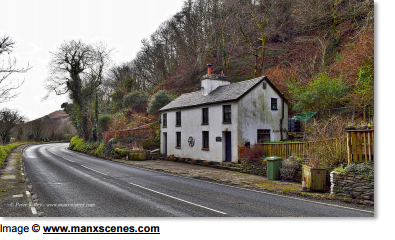 From the left hand corner at the Chapel, the road goes down Barregarrow Hill, past the 13th Mile Marker on the right, to the Bottom of Barregarrow, where there is another left hand bend round the cottage. The outside of the left hand bends at the top and the bottom of Barregarrow, on the right side of the course, are restricted areas. The Bottom of Barregarrow is not accessible by vehicles unless the roads are open. The course continues past Cammall Farm on the right, and past the original 13th Milestone. After the 13th Milestone the road goes down hill past Cronk Urleigh Farm on the right, and on to Westwood with Westwood cottage on the right. The left hander here is also known as Ballalonna Bridge related to Ballalonna Farm that is on the inside of the course. The road then goes past Brake Leg, which is just before the dip that leads onto the straight that runs up to Kirkmichael and Douglas Road Corner. 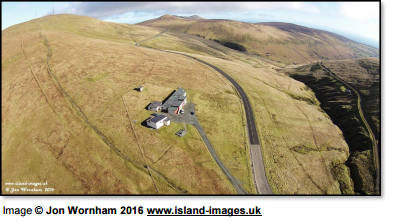 The run in to Kirkmichael is seen in the picture here. On the way in to Kirmichael you pass the 14th Mile Marker on the right. A right hand corner at the entrance to Kirkmichael Village. 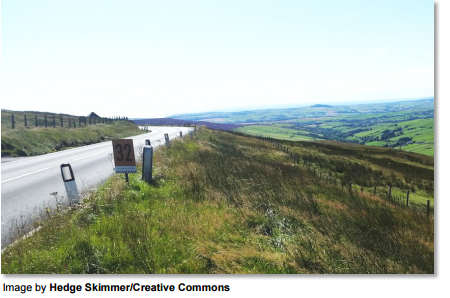 Sometimes referred to as Kirkmichael Corner. 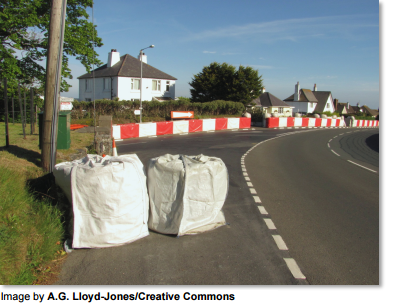 Access to this corner is possible when the roads are closed via the A4 Peel to Kirkmichael coast road, the entrance to which can be seen on the left in the photo. 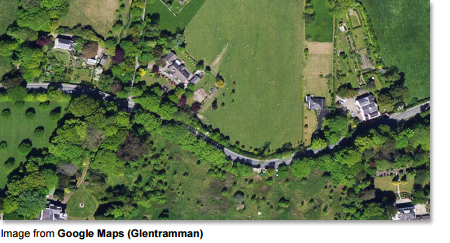 Glen Wyllin Campsite is on the A4 road just a short distance from here. During practices and races there is a Travelling Marshal located here. Passing through Kirkmichael there are a number of landmarks. The Mitre pub is a short distance from Douglas Road Corner on the right hand side. Whitehouse Park is a little further along on the right where there is parking, toilets and refreshments. Coopers’s Close, The Old Vicarage and Penny Bridge Stables are all on the left before the petrol station on the way out of Kirkmichael. Having passed the 15th Mile Marker, the next section of the course is the very technical Birkin’s Bends. 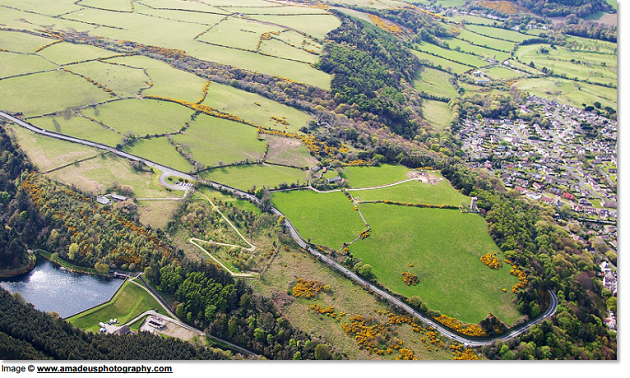 Also referred to as Rhencullen which is the name of the whole section (previously Rhencullen 1,2, 3 and 4). The name Birkin’s Bends generally refers to the first part of the complex. After this come Orrisdale South Cloudy Lane and Bishopscourt on the left. Closed road access is by foot only. At around 16.5 miles into the course on the left is Alpine Cottage. It is a fast left hand entry and a fast right exit. The Marshals shelter is seen here. During practices and races, one of the two Medical Helicopters is located here. It is not accessible when the road is closed other than by foot along the path (disused railway track) that runs just outside the course in this area. Portaloo available. After Alpine comes Ballacob which is also known as Brough Jairg Bends (See Through Bends). Shortly after Ballacob is the 17th Mile Marker on the right. 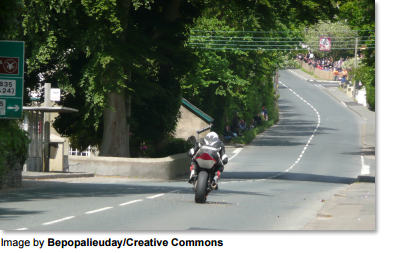 Another iconic part of the Mountain Course because of the famous jump over the bridge. Access to Ballaugh when the road is closed is possible via the A13, Jurby Rd from Ramsey and then the A10. 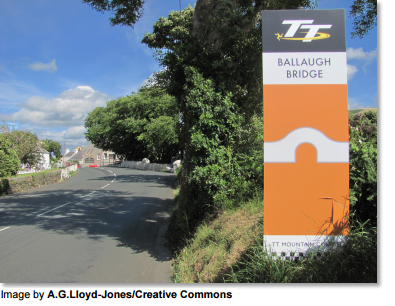 If you are on the inside of the course at Ballaugh, you can take the narrow Ballaugh Glen Rd via Druidale to Brandywell Cottage from where you can access other TT course locations such as Brandywell or you can get back to Douglas via the B22 to Strang past Injebreck Reservoir and taking the TT Access Road. On the right, just after the bridge, is The Raven public house. 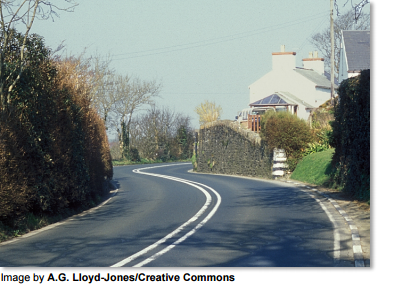 It is on the junction between the Course and Ballaugh Glen Road. 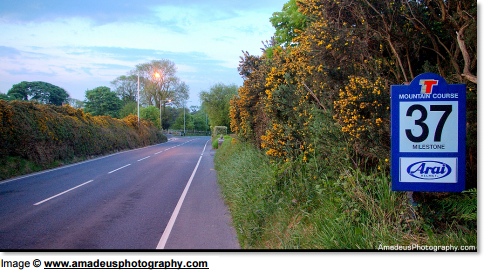 A short way down Ballaugh Glen Road, on the left is Ballamoar Campsite. Opposite The Raven there is a small plaque on a gatepost commemorating Karl Gall, a BMW rider who crashed here in 1939. Just before the 18th Mile Marker is Ballacrye Jump. Again, it is inaccessible by vehicles once the road has closed, however it is a great place to take pictures! There are restrictions in place in certain areas so be sure to read any signs and to follow instructions from the Marshals. After the jump, Ballavolley Bends are a series of gentle curves on the way to the Wildlife Park. The 18th Mile Marker is on the right. The next section of the course is Quarry Bends, quite a technical section, thought by many riders to be one of the most important on the course in order to get a good lap time. Parking is in the car park of The Wildlife Park on the left. The Marshal’s hut is also in the car park. Toilets and refreshments are available. It isn’t accessible by vehicle when the roads are closed but can be accessed via the disused railway line. 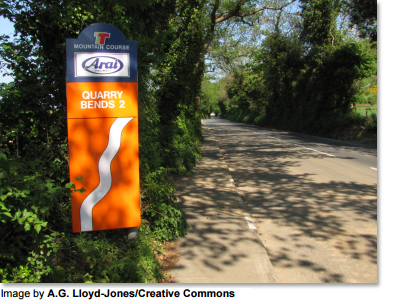 After The Wildlife Park is Gob-y-Volley, a right hander at the end of Quarry Bends. The 19th Mile Marker is on the left. 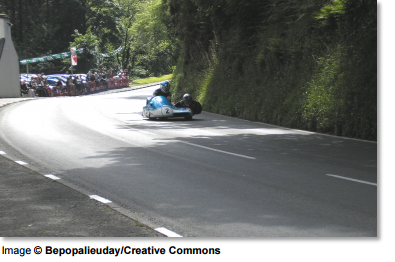 With Quarry Bends behind you, it is on to Sulby. 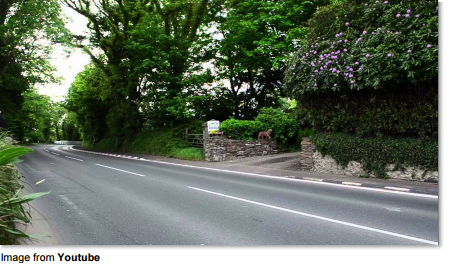 At Sulby Crossroads you will see The Sulby Glen Hotel on the left hand side. Opposite the Hotel is Caley’s Store which is a general store selling a range of refreshments. 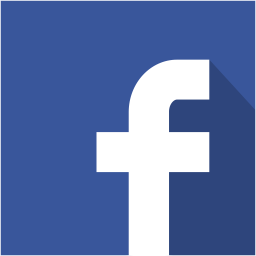 You can ge t to the cross roads whilst roads are closed from Ramsey via the A13, Jurby Road to Sandygate, and then left onto the A14 Clannagh Road. 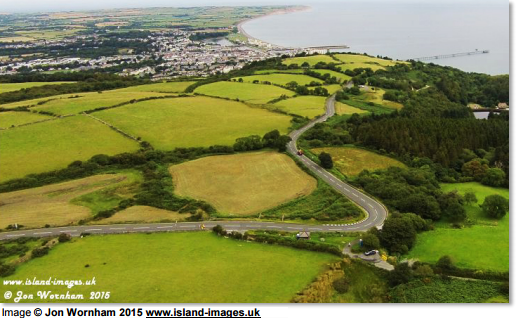 From the inside of the course you can get to the crossroads via Sulby Glen from Tholt-y-Will. Toilets are available in The Chapel on the outside of the course. At speeds of over 200mph this is one of the fastest parts of the course. Although there is only a very slight right hand kink in the road, at those speeds it isn’t as straight as you might think, especially since the road surface is also quite bumpy! 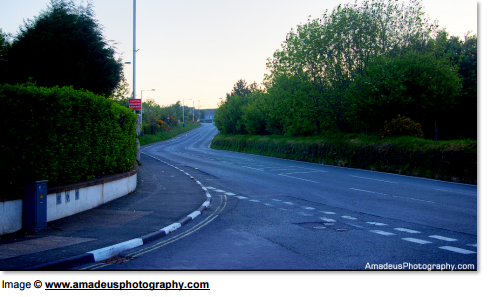 The picture here is looking back from the straight towards The Sulby Glen Hotel and the crossroads. 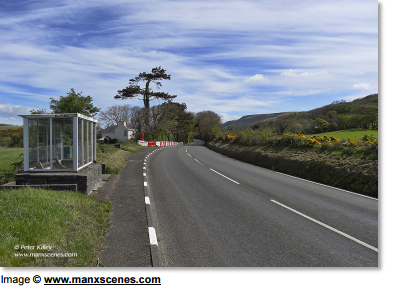 At the end of Sulby Straight is the right hand corner at Sulby Bridge. 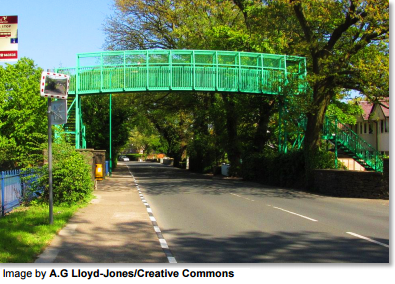 It is accessible from Ramsey via the A13, Jurby Road to St. Judes, and then left onto the A17. Parking is available outside the course. On race days there may be some refreshments available. There is also a Portaloo about 100yds down the old railway line from the bridge After the bridge you pass the 20th Mile Marker on the right hand side. 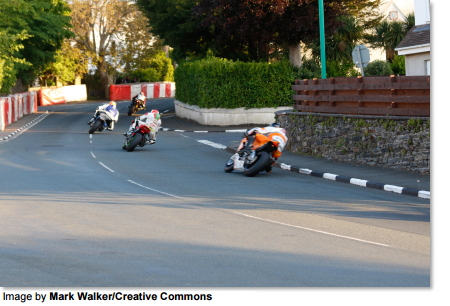 Just after Sulby Bridge is the left hand corner at The Ginger Hall Hotel. Access whilst the roads are closed is possible from inside the course via the B8 from the A14 Sulby Glen Road running from Bungalow, through Tholt-y-Will, to Sulby Cross roads. Parking is available at the Hotel and obviously refreshments are available! This is a fast and quite technical bit of the course in 3 parts. It comprises Kerrowmoar 1, a left hander then Kerrowmoar 2, a right hander and then Kerrowmoar 3 a left hander before a crest. 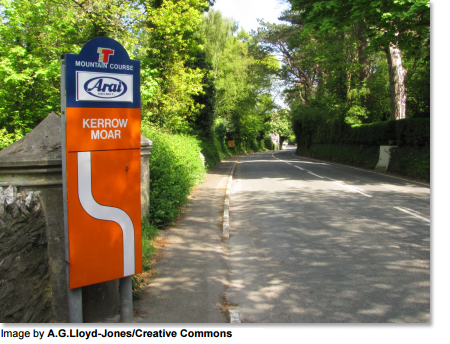 Kerrowmoar 3 is sometimes known as Abbeyville. It is not accessible once the road isclosed. Shortly after you pass the 21st Mile Marker on the left side. 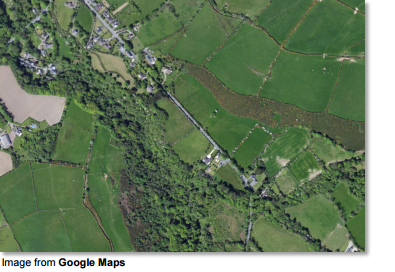 Glen Duff is fast and quite straight past Bernaharra Road on the left, then Glen Duff Depot on the right, Café Rosa (formerly The Lezayre Tearoom) on the left and then Glen Duff Farm. A slight right hander at Garey Road marks the start of Glentramman, followed by a hard left. Closed rd access to Glen Duff is via the A13/B14 from Ramsey. This section of the course is known as Churchtown. Lezayre Church, seen here is on the right of the course. Ballakillingan Farm is on the left, and then the course goes through a section known as Conker Fields (See below). There is no access to Churchtown from inside the course when the road is closed, but there is a loop of road on the inside, by the War Memorial, that you can park in provided you get there on open roads. From outside the course you can take the A13 and then Garey Rd. Conker Fields on the inside of the course and extends from the War Memorial at Churchtown as far as The Caravan, and includes The K seen here, where there is a large ‘K’ painted on a tree on the left. 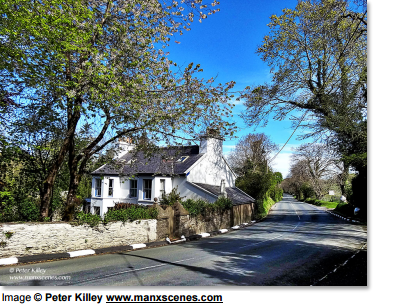 The course carries on past Sky Hill and Pinfold Cottage also known as Milntown (named after Milntown House on the right of the course) and then Glen Auldyn Bridge also sometimes called Milntown Bridge. Past Schoolhouse, this is now the run into the centre of Ramsey. Bircham Ave is on the left as you approach Parliament Square. A right hand corner around The Swan pub past Raymotors on both sides of the road and on to Albert Terrace. Past the Bus Staion and Coronation Pk on the right, to Cruickshank’s which is a right hand corner as seen here. This is the bottom of May Hill. During practices and races, an ambulance is located at May Hill to transfer any casualties to Ramsey Cottage Hospital where they are picked up by helicopter. 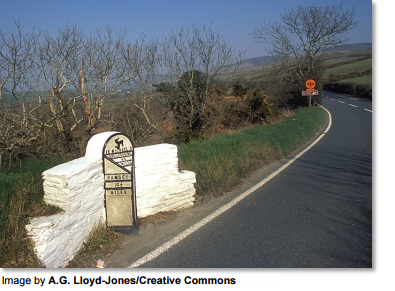 At the top of May Hill is the left hand Whitegates with Lheaney Road on the left. 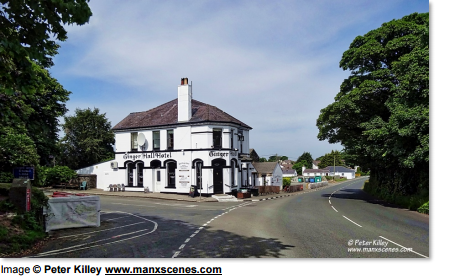 After Whitegates, comes the right hand corner Stella Maris (named after a private house of the same name) on the way to Ramsey Hairpin which is one of the slowest points on the course. There is a radio commentary point here. Parking is very restricted at the hairpin. Options are: if the roads are open, park in Ramsey, walk up May Hill and turn left onto Lheaney Road. Take a right onto Crescent Road and right again onto The Crescent West. This brings you out just above the hairpin so you can walk down to it. If the roads are closed there is a path, Claughbane Walk, that starts from the main Laxey to Ramsey road, the A2, just before the point where the tram line crosses the road as you enter Ramsey. Walking up the path takes you to Waterworks. Be aware, it is quite steep! 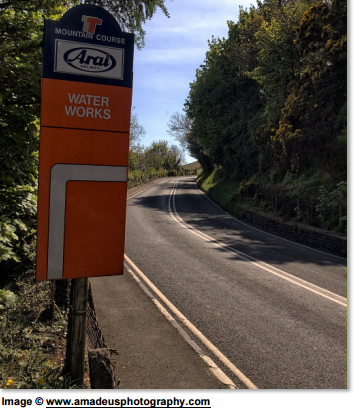 After Ramsey Hairpin comes Waterworks 1 and 2. The roads close on the mountain section of the course before the other parts of the course to allow time for the course to be set up for racing. For Marshals and Medics wanting to get to points on the mountain they have to either get there early before the road closes, or join the convoys that leave about 15 minutes after the roads close. The convoy that leaves from Ramsey gathers at Lheaney Road. Full details of this process are available on the FAQS page of this site (section 3.1). Within this picture you can see Waterworks 1 and 2 at the bottom right and then the right and left of Tower Bends. It is inaccessible by road once the road is closed (except with the Marshals’ convoy). Parking is in the Water Board layby that can be seen just above the bends. It is advisable to park here for Waterworks as well and walk down as there is no parking there. The 25th Mile Marker is just before the layby. The Albert Tower or Albert Memorial can also be seen in the picture. 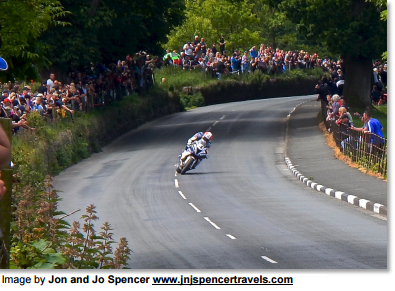 This picture shows the hard right hand bend,Gooseneck just above Tower Bends. Parking is available in the field behind Gooseneck. On race days there are usually refreshments available. 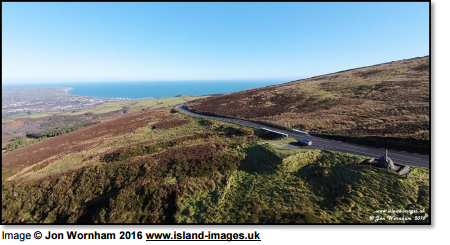 Gooseneck is accessible when the roads are closed via the Hibernia road that turns off the main A2 Laxey to Ramsey coast road. It can be seen running from the bottom right in the picture. 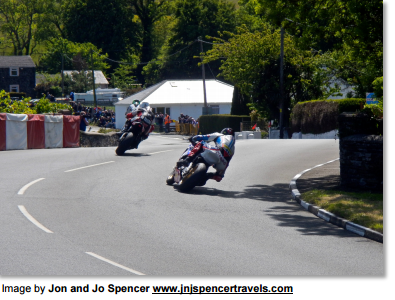 After leaving Gooseneck, there are 2 fast left hand bends before getting to Joey’s. The 26th Mile Marker is just before Joey’s. 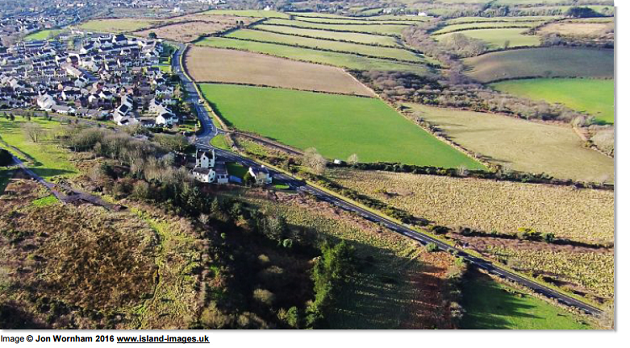 There have been proposals to name these two nameless bends Centenary Bends, or Lougher’s. 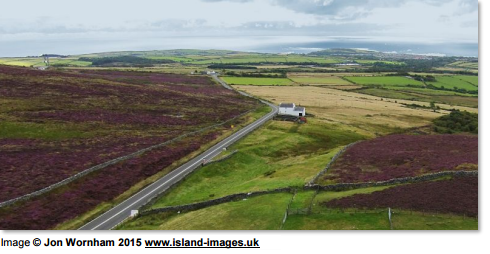 They can be seen in the picture here above Gooseneck. 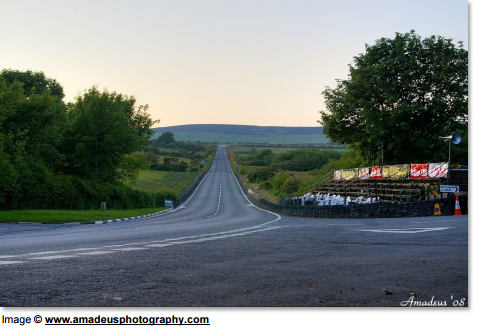 The 26th Milestone is called Joey’s after Joey Dunlop, 26 times TT winner. He was tragically killed in a road race in Estonia in July 2000. An Isle of Man based Charity, The Joey Dunlop Foundation bears his name. Their aim is to provide specialist accommodation for people with disabilities visiting the Isle of Man. 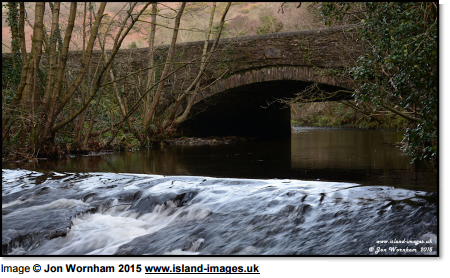 In 2008 they bought Braddan Bridge House and they have been welcoming visitors there since 2010. 3 left handers before the memorial and a right hander on the exit. 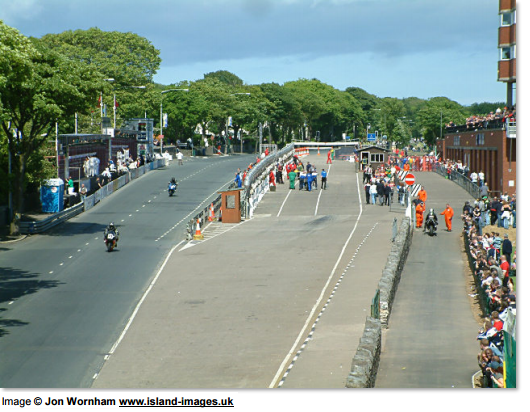 It is named after James Guthrie, a TT winner in the 1930’s. There is parking for Marshals on the right. The memorial can be seen in this picture. None of these areas is accessible by road once the road has closed. Marshals and Medics can join the convoy that leaves Lheaney Road after the road closes. After Guthrie’s Memorial you arrive at the Mountain Mile.It starts with a right hand kink. 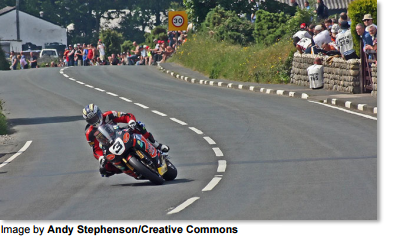 At racing speeds, the bikes are doing 180-190mph on the incline up the mile. The 28th Mile Marker is on the right. 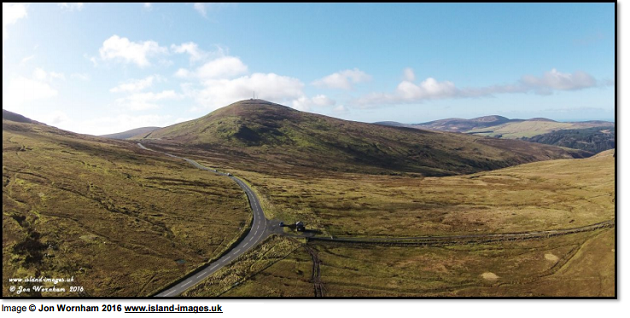 This picture is looking from Guthries south towards the Mountain Mile with Snaefell in the distance. Mountain Box also known as East Mountain Gate is at the end of the Mountain Mile and is seen to the right of the course in the picture below. There is parking for Marshals and Medics. Not accessible once road is closed except via Marshals’ convoy from Ramsey. Having passed Mountain Box and the 29th Mile Marker on the right, you soon arrive at George’s Folly also sometimes referred to as Rice’s Corner. On the left at this point is Mike Casey Shelter. Shortly after, on the right side is Black Hut or Stonebreaker’s Hut seen here in the photograph. 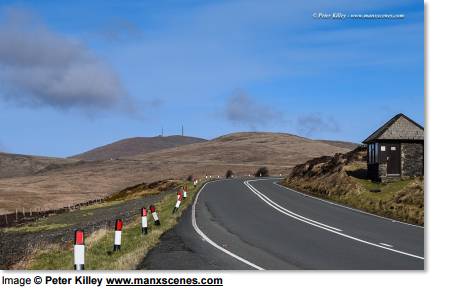 Like many of the points on the Mountain section of the course, this is only accessible by vehicle when the road is open, Marshals and Medics can get here after the road has closed in the convoy that leaves Ramsey, usually about 15 minutes after the mountain section of the course closes. Limited parking and no public parking. Shortly after Black Hut comes Verandah. It is described as four right hand corners, but is ridden as a single long right hand bend. At the end of it, at Bungalow Bridge is Les Graham Memorial. Les Graham died at Bray Hill in the Senior TT in 1953. The stone was shelter built in his memory in 1955 in the form of an alpine lodge. It is inaccessible once the roads have closed and there is no parking (a few bikes can park on the grass). Like all of this section of the Mountain it can get very cold so be sure to take warm clothes! This picture is taken from Bungalow looking back towards Bungalow Bridge and Verandah. The building in the picture is the old Motorcycle Museum. 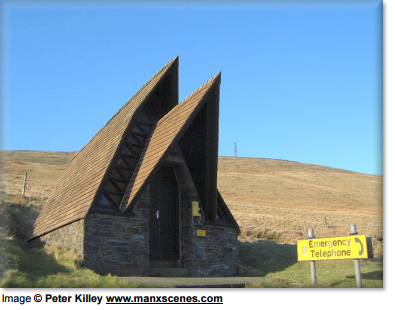 It was originally built as a Cold War Air Defence radar station. This is a left then right hand corner. 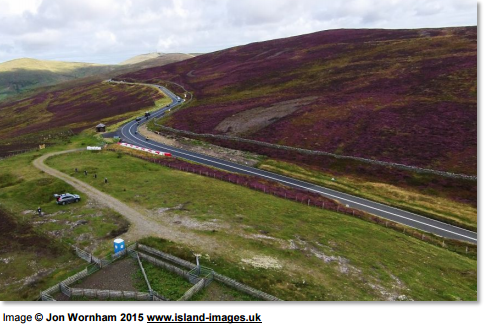 It is accessible from Sulby via the A14 Tholty-Wil Road (seen heading to the right in the picture) or from Laxey Station via the Snaefell Mountain Railway. Marshals and Medics can come up to here with the convoys that leave after the road has closed. There is good parking and refreshments are available. It is a very popular spectating spot. During practices there is an ambulance located here. It can get cold so warm clothing advised! 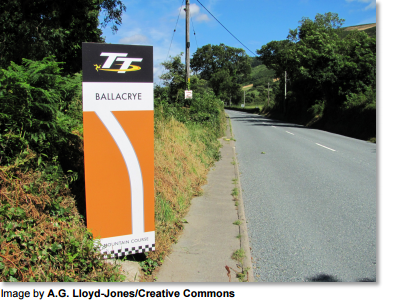 Past the 31st Mile Marker, from the foot bridge crossing the road at Bungalow, is Hailwood Rise, which is named after Mike Hailwood. 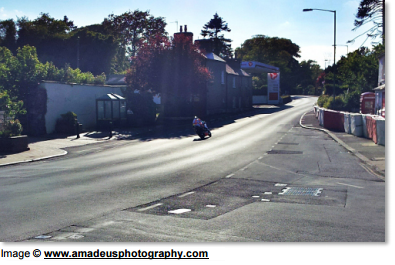 The course goes past Hailwood Heights where there is a sign on the left. 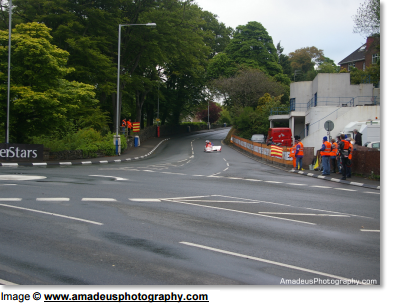 This is now approaching the highest part of the course at Brandywell. The picture here is looking back from close to the top of Hailwood Rise at Bungalow. 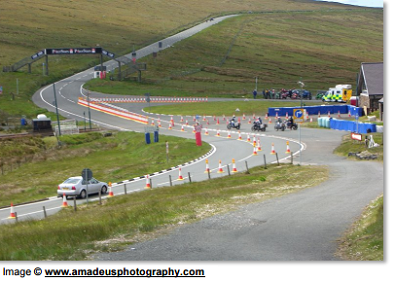 The course then leads on to Brandywell at the junction of the B10 road and the Mountain Road. The shelter for Marshals (seen below) is on the right. This is quite a hard left hand corner, and is the highest point on the course at 1385 feet above sea level. There are good views back down Hailwood Rise towards Bungalow as well as on towards the 32nd. 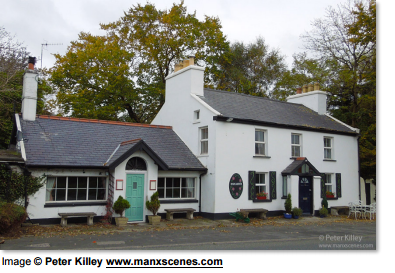 It is accessible from Ballaugh via the narrow Druidale Road as well as from Douglas via Strang, Mount Rule, past Injebreck Reservoir and to Brandywell Cottage on the B10. Parking is good here on the B10 and there is often mobile catering during TT. 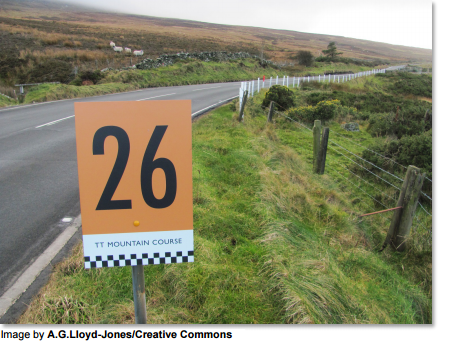 The 32nd Mile Marker is just beyond Brandywell on the right. Renamed Duke’s after 6 times winner Geoff Duke, this is a triple apex left hander. Limited parking for Marshals or Medics in the layby opposite the entry flag box. There is a stone Marshals shelter a little further on. No catering and inaccessible once the road closes. After the 32nd comes Windy Corner, a fast right hand corner taken at about 150mph by the fast riders. 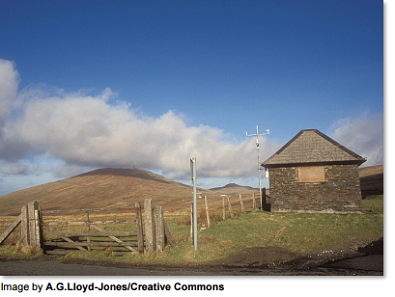 There is a stone Marshals’ shelter on the left as seen in the picture below. Parking is good in the track behind the shelter. Called Windy Corner for a reason- so take warm clothes! Inaccesible once roads close other than by the track that can be seen approaching the back of the hut in the picture above. Not suitable for cars but OK for off road bikes. The track joins Baldhoon Road and then the Cregny-Baa back Road. A double apex left hander. Stone hut on the left for Marshals. Limited parking in layby for Marshals and Medics. It is not accessible once the road closes. After passing the 33rd Mile Marker, the next corner is at Keppel Gate. There is a right hander on the entry followed by a left. The stone hut on the right of the course in the picture is the Marshals’ shelter. 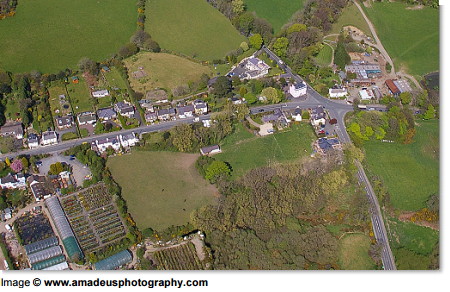 There is good parking in the area leading towards the sheep pens seen at the bottom right in the picture. No food available although the Marshals look after medical staff very well! One of the two Medical Helicopters is located here. Not accessible once the road closes (except by air!). Portaloo behind the hut for Marshals/Medics. On the right after Keppel Gate is Kate’s Cottage. It is a left hand corner. Originally Tate’s Cottage after the family that lived there, it became known as Kate’s Cottage after a slip of the tongue during a pre-war BBC commentary. Limited parking for Marshals and Medics only, and not accessible once the road is closed, although spectators can park at the Cregny-Baa and walk up the outside of the course to spectate at Kate’s. 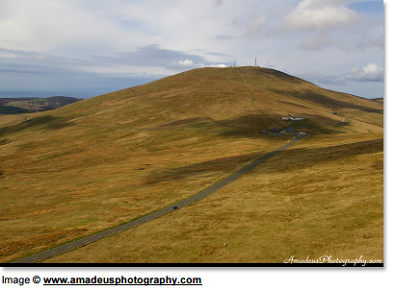 The middle picture is taken from Keppel Gate, looking down towards Kate’s with the Creg-ny-Baa in the distance. The bottom picture is taken from the other side looking back up the course. No food is available at Kate’s so take your own. The 34th Mile Marker is just beyond Kate’s on the right (course direction). 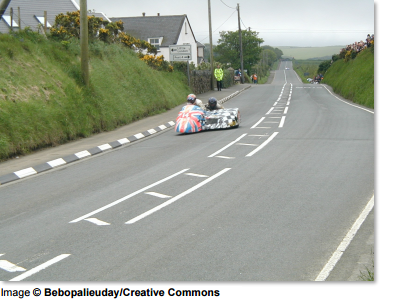 Creg-ny-Baa is another icon location on the TT Course. It is quite a sharp right hand corner. It is a popular spectating spot and there is a small grandstand. Plenty of parking in the field at the bottom right of the picture (entrance off the Creg-ny-Baa back road). 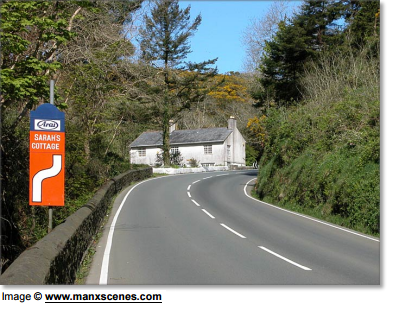 It is accessible via the B12 road from the main Douglas to Laxey road whilst roads are closed. One of the Marshals’ convoys going up the mountain after roads close leaves from here. Refreshments available. The 35th Mile Marker is on the right just past the Creg-ny-Baa. The section from Creg-ny-Baa to Brandish goes past Gob-ny-Geay Farm on the right, also known as Sunny Orchard. It is one of the fastest sections on the course. Brandish is a fast left hand corner (seen below). It is named after Walter Brandish who broke his leg here in 1923. There is a Marshals’ shelter set back a bit on the right with limited parking for Marshals and Medics. 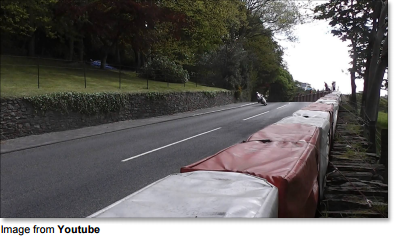 This is a fast right hander at the end of the straight drop down from Brandish. There is a small grandstand on the left (course direction). Food and toilets are available. 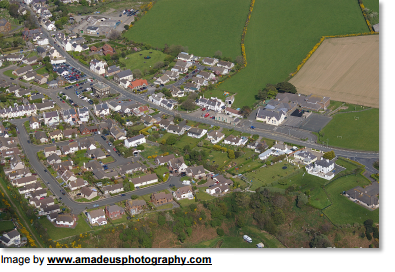 It is accessible from Onchan via School Road (the third left after The Manx Arms) and Little Mill Lane. The 36th Mile Marker is on the left, and Glen Dhoo Campsite is on the right as you head towards Cronk-ny-Mona. Having come downhill from Brandish to Hilberry, the road now goes up hill again. After negotiating Hillberry the next corner is Cronk-ny-Mona. It is a fast left hander. Traditionally, when a rider passes Cronk-ny-Mona, a light above his number on the main scoreboard on Glencrutchery Road comes on, to let spectators there know that a rider will soon be with them. The Marshals’ shelter is on the right. Easy access via Johnny Watterson’s Lane, seen here running down the right of the houses. Signpost is a right hand corner where the mini-roundabout is. The Marshal’s hut is on the corner. 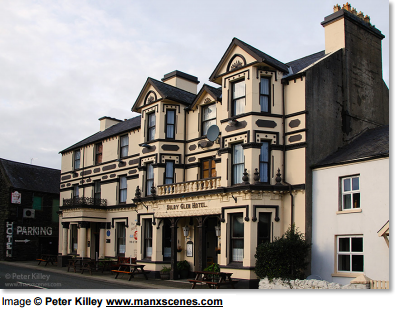 It is easily accessible from Onchan by turning onto the A39 by The Manx Arms. From The Nook the course follows the old stretch of road that is normally closed to Governor’s Bridge (see picture above). There is then a very tight right hand turn into Governor’s Dip and out onto Glencrutchery Road. Victoria Road is on the left and Hillberry Green on the right. Further on you pass Duke’s Ave on the left before crossing the Start/Finish line. The Grandstand area is easily accessible when the roads are closed via St.Ninians Road. There is lots of parking in the field to the left as you enter the area. This interactive map of the TT course is a resource to help doctors and paramedics learn more about the milestones around the track. Click on each milestone to read more information about it. If you have any trouble viewing or using the map above, please get in touch using the information on the contact page and we will do our best to help you.